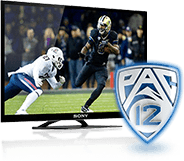 Fans with access to Pac-12 Networks' YouTube International channel will see a 24-7 live feed of Pac-12 Network, our primary channel. That will over 30 football games, over 150 men's and women's basketball games and many live Olympic sporting events in addition to Pac-12 Conference tournaments and championships. To learn more about this service please visit Pac-12.com/pac-12-networks-international.